This is the 3rd edition of the 2018-19 Young Bucks Tracker. Being drafted in the second round, as Connaughton was in 2015, hardly ensures NBA success. Yet the 6-foot-5 guard has stuck with basketball despite also being taken in the 2014 MLB draft by Baltimore. Connaughton did pitch briefly in the minors in 2014, but has concentrated on his basketball career since. He didn’t get too much playing time in Portland, averaging 4.2 minutes per game over 34 games in 2015-16 and 8.1 minutes over 39 games in 2016-17 before playing in all 82 games last season and averaging 18.2 minutes. His signing by the Bucks this offseason didn’t create much more than a ripple and he played in just one of Milwaukee’s first four games, and even then was on the court for fewer than four minutes. 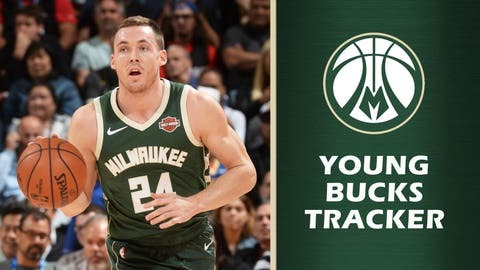 But Connaughton has played in every game since and in the Bucks’ four contests last week, he received 21 or more minutes in three (and 18 in the other). In the win over Golden State on Nov. 18 he had a season-high 15 points, which he topped with 16 against Memphis on Nov. 14. Connaughton is averaging 7.7 points and 4.5 rebounds — both would be career highs (he averaged 5.4 points and 2.0 rebounds last season) despite playing just 16.5 minutes. Additionally, his 125 offensive rating and 105 defensive rating are career bests. Like most everyone else on Milwaukee, Connaughton can shoot the 3, and has five games so far in which he’s hit multiple. On the season, Connaughton is making 37.1 percent of his 3s, but also 61.3 percent of his 2s (the latter would be a career high by a large margin). When Connaughton is on the court, good things seem to happen for the Bucks. He had a positive box score plus/minus in all four Milwaukee games last week and overall was a plus-61 — the highest on the team. An under-the-radar signing, Connaughton is now on the map in his contributions. — Giannis Antetokounmpo has scored 20+ points in eight straight games and in 13 of his 14 contests. This past week he averaged 26.0 points, 11.3 rebounds, 5.0 assists, 2.5 steals and 1.8 blocks while shooting 60 percent from the field. — Malcolm Brodgon scored 20+ points in three straight games — 20 at Golden State, 23 at the L.A. Clipers and 20 at Denver — before being held to eight against Memphis. — Thon Maker‘s playing time has been sporadic this season, but he gave the Bucks a bit of juice in the Grizzlies game. Playing 9 1/2 minutes, Maker had three points, two rebounds, two blocks and an assist and had a box score plus/minus of +17. — Sent to the G League’s Wisconsin Herd, Sterling Brown had 23 points and three steals in 34 minutes in a 122-115 loss to Ft. Wayne on Nov. 14. Christian Wood, in his first game with the Herd, had 13 points, nine rebounds and three assists. Brown was recalled to the Bucks.